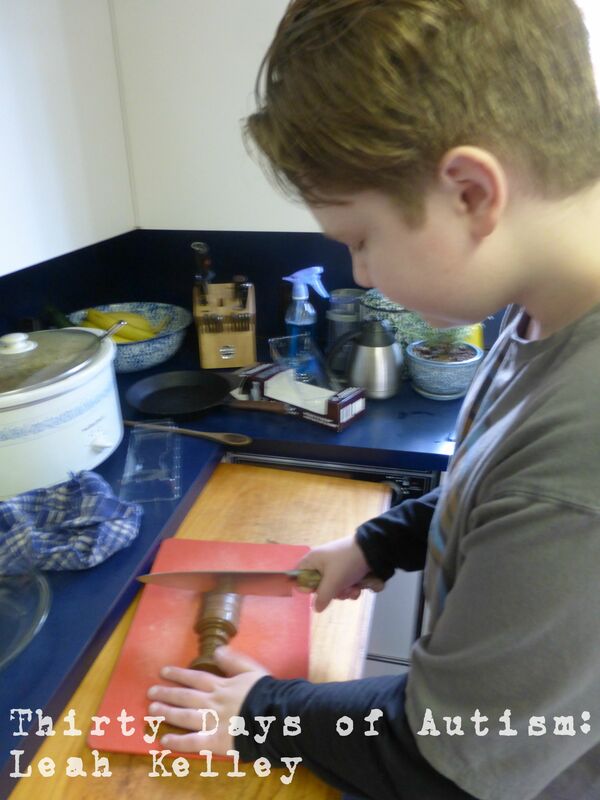 Usually H’s inventions are constructed and engineered with mechanical elements, and they have frequently revolved around exploring alternative ways to create or build an exoskeleton or what have you – but lately H has shown an interest in experimenting with cooking. I can see how inventing recipes has a similar appeal for H.
Today H is making a giant peanut butter cup. He has been wanting to do this for a while and has been planning. H expresses himself with his creations … so this seemed like the perfect thing to share for the Autism Positivity Flashblog, which this year is celebrating diversity in expression. I love peanut butter cups but I think they are too small, so now I am going to deplete my peanut butter cup craving. I was th inking, where am I going to get all the chocolate? And then I thought, well Easter is coming up – and then after Easter all the chocolate bunnies and stuff will be half price, so I will be able to get large amounts of chocolate for very cheap. He chopped and melted the chocolate. It is important not to overheat the chocolate. It works well to melt it in a pyrex measuring cup in a pot of water – like a double boiler – but much easier to handle. 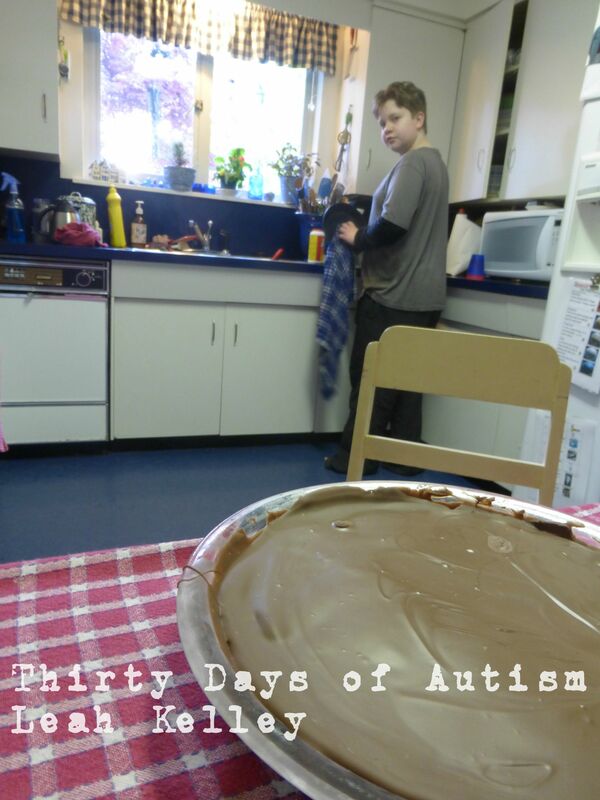 H then spread the melted chocolate in the bottom of the pie plate, and after chilling it in the freezer, he added the mixture of peanut butter and icing sugar. 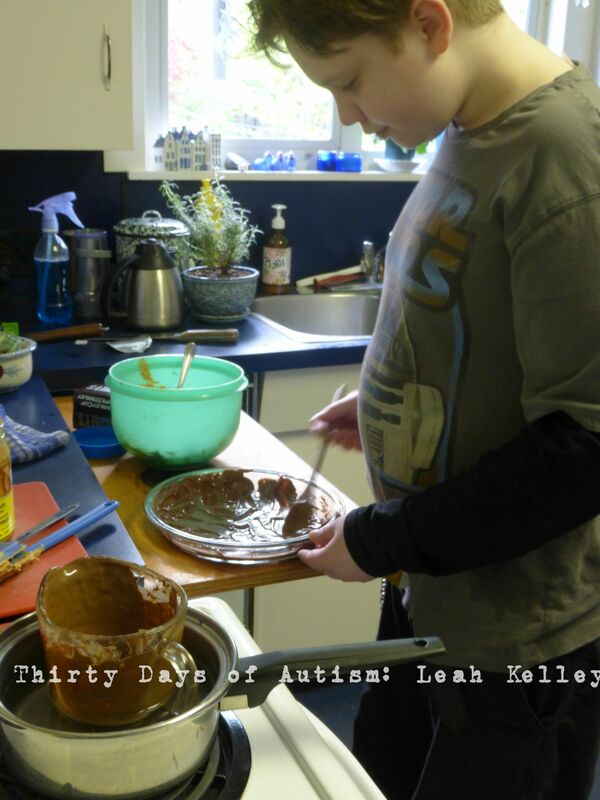 He found that the peanut butter mixture spread more easily with a wooden spoon lightly dipped in water. 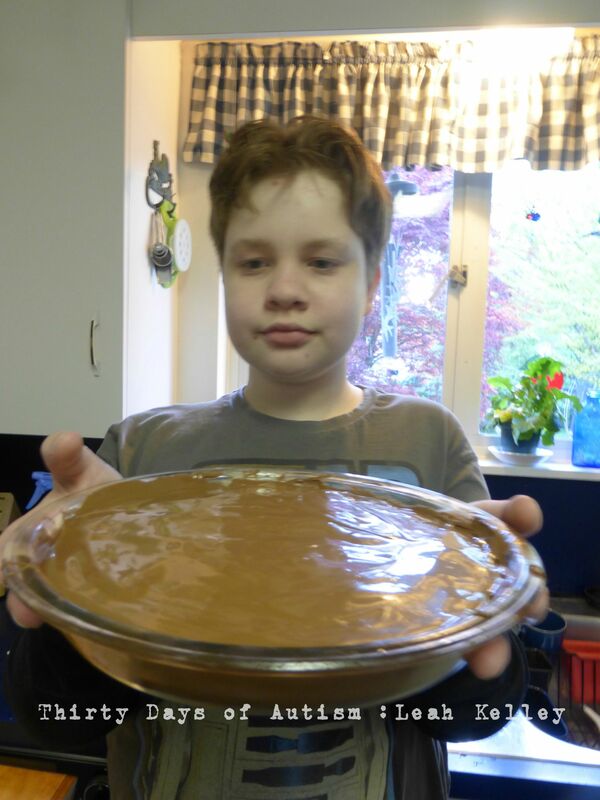 H melted more chocolate and spread it over the top of his giant peanut butter cup pie, and then chilled it again in the freezer. H: This is more epic than Epic Meal Time! It is beautiful mom. Do you think it is beautiful?? Me: Yes… but it might be stuck in the pan. I am not sure what will happen when we try to get it out. 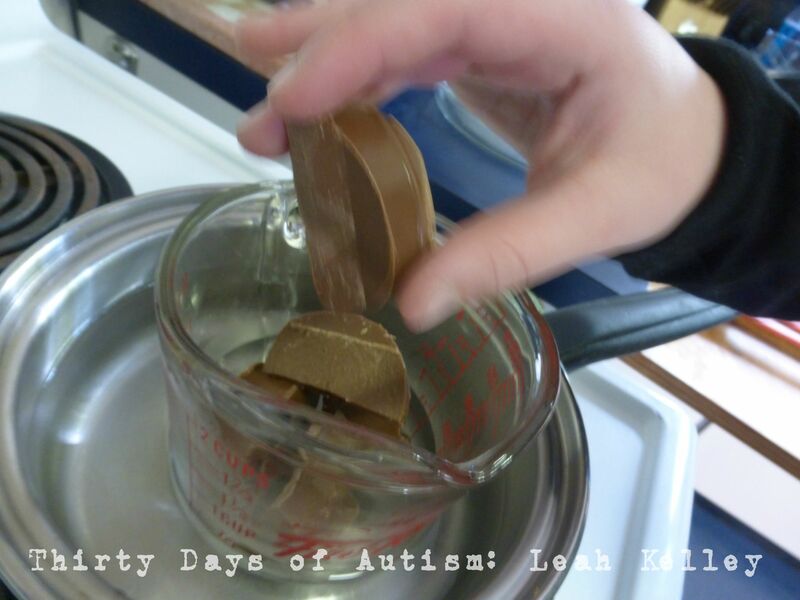 H: That’s okay – this is an experiment and it was fun! Now H is washing dishes. I usually do that part – but it seemed timely to step it up a notch. 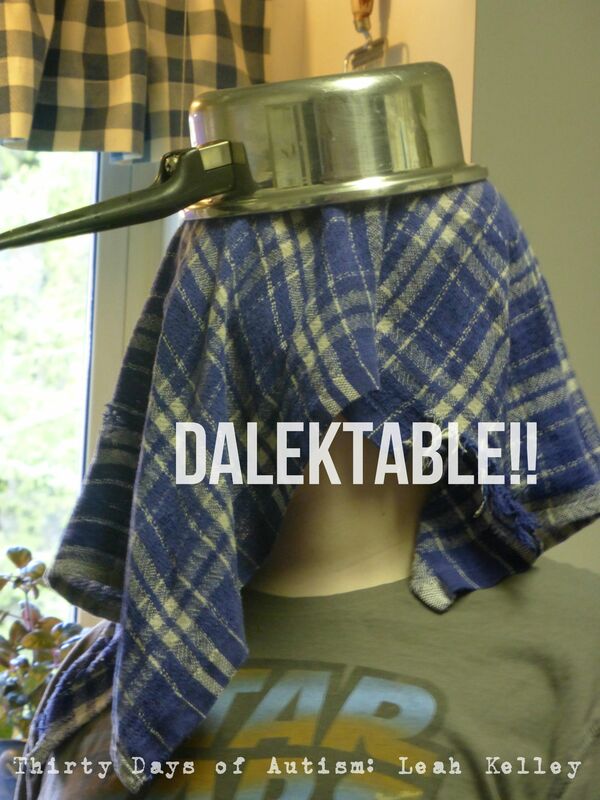 And then… I looked up after I was writing this to discover H had dried and put the dishes away as well! Lovely! H says: Autism Positivity is about feeling good about being the way you are and figuring out for yourself how being Autistic is good for you. It is about finding out about who you are and who you want to be. As I am winding up this post, H has headed off to share his creation with his online Minecraft friends. I can hear him in the other room: Look at this MASSIVE peanut butter cup I made! It is a monster!! I can hear the pride in his voice! 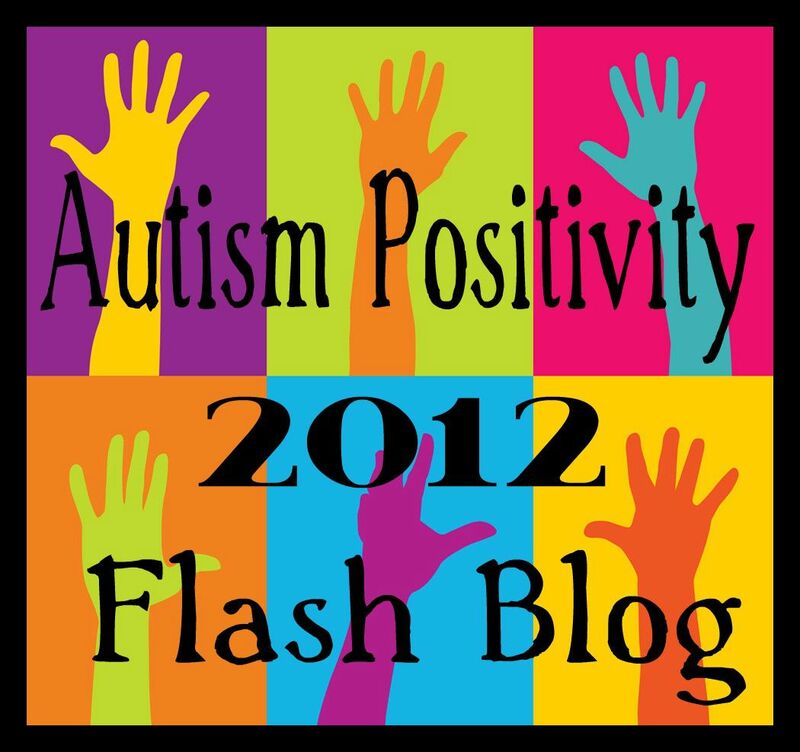 This post is a part of the Autism Positivity 2014 Flashblog. You can find this and other participating posts here. 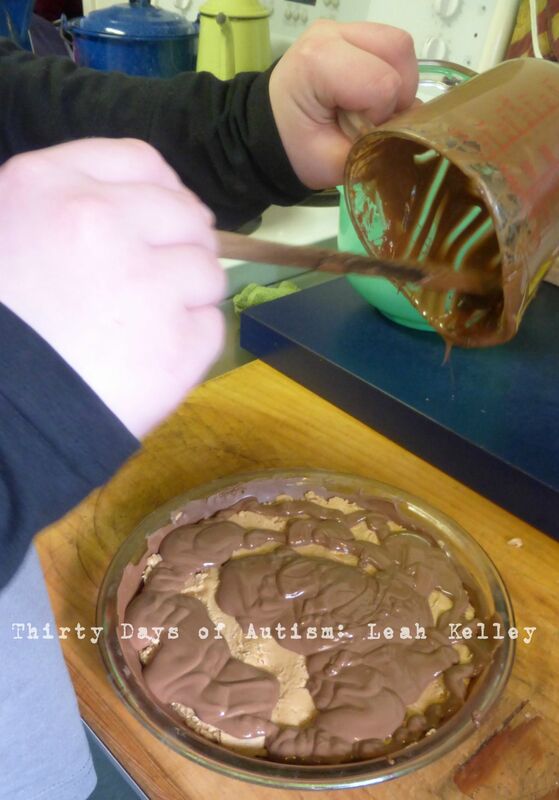 This entry was posted in Autism, Autism Positivity, Cooking with kids, inventing and tagged #AutismPositivity2014, Autism Acceptance Month, Autism Postitivity Flashblog, Chocolate, Cooking, Dalek, Expressions of PosAutivity, inventing, minecraft, Monster Peanut Butter Cup. Bookmark the permalink. Awesome. Wonderful. So preciously articulated. I see a small, intimate restaurant on a beach. Where H brings his joy in himself and his creating to others. The human round is made to go more joyously. The sun goes down, seen in all the beauty of that. Looks amazing! It’s a shame I can’t taste it. Especially because it is most CERTAINLY big enough to share! The most positively fun post of the day! 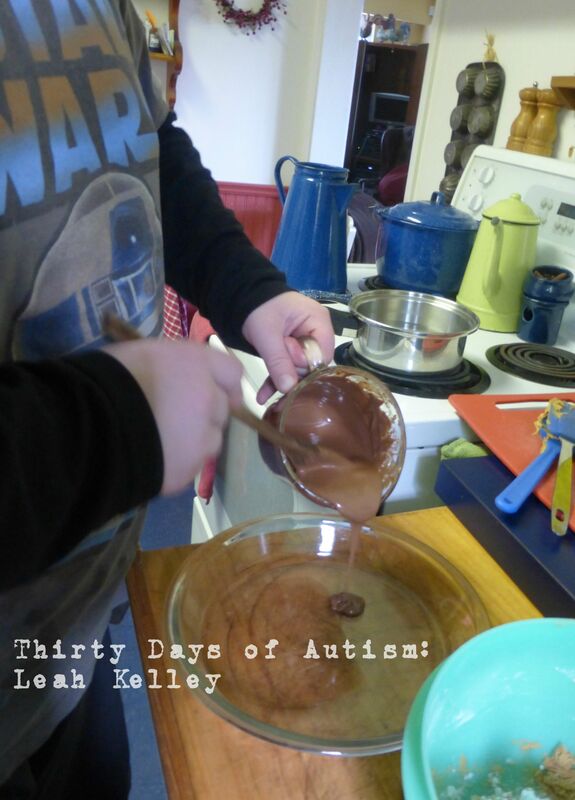 H served up the sweetest concept of what being autistic is! XO! So so so FUN and AWESOME!! !